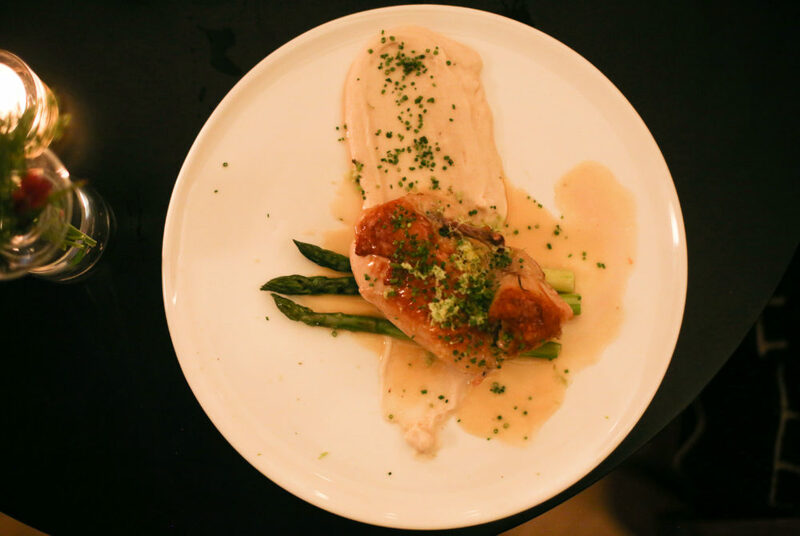 The Pennsylvania half chicken ($28) at Brothers and Sisters is served herb-roasted atop a celery-root puree. Nestled in the lobby of Adams Morgan’s Line hotel, Brothers and Sisters takes a modern approach to international cuisine. The hotel pays homage to its roots as a former church, with a chandelier made of an old organ serving as evidence in the lobby. Four deep blue velvet couches are positioned at the center of the restaurant and dark wooden booths like those of an old cathedral flank the interior. At Brothers and Sisters, one of the three cuisine spots inside the 1770 Euclid St. NW hotel, restaurateur Erik Bruner-Yang offers diners three meals daily from 6:30 a.m. to midnight. The all-day menu is served for lunch and dinner and caters to adventurous eaters with some safer bets for pickier people. From octopus hotdogs ($19) to the fried chicken club sandwich ($18), there truly is an option for everyone. Dessert is also a must at Brothers and Sisters, so be sure to save room. The three-layer cakes, baked by James-Beard-nominated pastry chef, Pichet Ong, are hard to resist. For $10 each, the decadent slices come in flavors like “The Song Saa,” a fancy take on coconut cream pie, and “The Brooklyn,” a chocolate banana coffee cake. Of all dishes at Brothers and Sisters, the Pennsylvania half chicken ($28) has been a restaurant favorite since the spot’s opening. This isn’t your mother’s dry chicken dinner. The meat melts in your mouth and a thin layer of skin adds the perfect crispiness to the breast. Artfully de-boned and lightly herb-roasted, the chicken comes served atop a generous bed of celery-root puree. The puree is the same consistency as mashed potatoes, but this vegetable substitute ups the ante and is plated so each bite is an ideal ratio of chicken to side dish. The meat is hearty and light at once and has been seasoned and cooked to perfection. What seems like a simple dish is heightened by attention to detail, which makes the heftier price tag worth every penny. Next time you want to upgrade a typical weeknight meal, head over to Brothers and Sisters for their take on the classic.